UNPO: West Papua: New Zealand’s Maori Students March in Solidarity with Papuan People. West Papua: New Zealand’s Maori Students March in Solidarity with Papuan People. 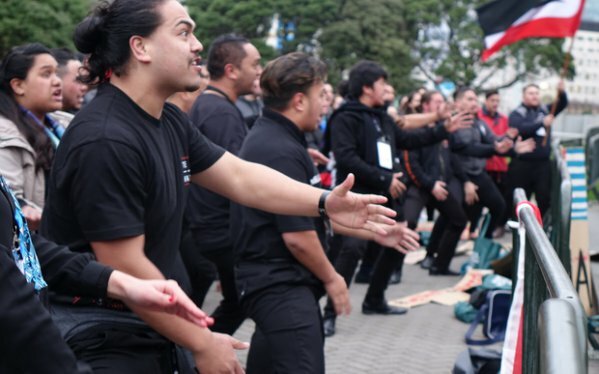 In a call to support the freedom of West Papua from Indonesian rule, hundreds of students from New Zealand’s indigenous Maori community took to the streets to march on New Zealand’s Parliament. The Students were met by MPs of various political parties in Wellington, as concern for the community under Indonesian rule has a significantly wide concern. Hundreds of Māori students marched to New Zealand's parliament today calling for freedom for West Papua. The march was met at the steps of parliament by MPs from various political parties, who spoke of their concern about Indonesian state oppression in the Papua region. The students gathered in the capital for the annual conference Te Huinga Tauira o Te Mana Ākonga, this year hosted by Ngāi Tauira, the Māori Students' Association at Victoria University of Wellington. A co-president of Ngāi Tauira, Raimona Tapiata, said the hundreds gathered felt strongly about the plight of West Papuans, from which they drew many parallels with how Māori experienced colonialism. He said for instance Maori can relate to the marginalisation of West Papuans' indigenous language under Indonesian rule. "Especially having come from similar backgrounds, similar cultural beliefs, similar values and what our culture is all about, all those types of connections between all Pacific nations is another element that comes into play, " he said. Addressing the crowd, the MP Marama Davidson said West Papuans' struggle was their struggle. "We are standing up for up for the people of West Papua, we are standing their mana whenua. We are standing up for their tino rangatiratanga," she said. “But we're also standing up for all of us and the better world we are trying to create by supporting each other, because the oppression, the colonisation, the abuse of human rights, it all breathes the same oxygen."